I realize our roofer dudes are wearing t-shirts on an oddly warm day in the above image, but I assure you it is now 10 degrees outside. Despite the cold, they continue to work, thank goodness. Any work we can get done on the new rental right now is bonus. Another great winter surprise for us is that our Farmhouse is doing well for February. 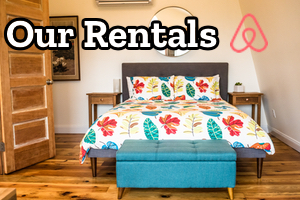 This is our first year anniversary of the rental business, this being our first winter, and we're pleased with the amount of nights rented. Here are some apartment size fridges that we love (but didn't want to pay full price for!). "Here's sander Mom ?" Ryanne you crack me up !!! It's probably getting warmer and warmer by you guys...better for your contractors. We're supposed to hit 62 this Friday here in Chicago..it's been such a mild winter!